Daddy Warbucks: What Do We Mean By 'The Wealthy'? : NPR Public Editor They are the subject of the fiscal cliff drama, and we find that the favored phrase by NPR reporters and hosts covering the negotiations is to call them "the wealthy." Some listeners rightfully object. However, alternatives such as "job creators" are also inaccurate and political. 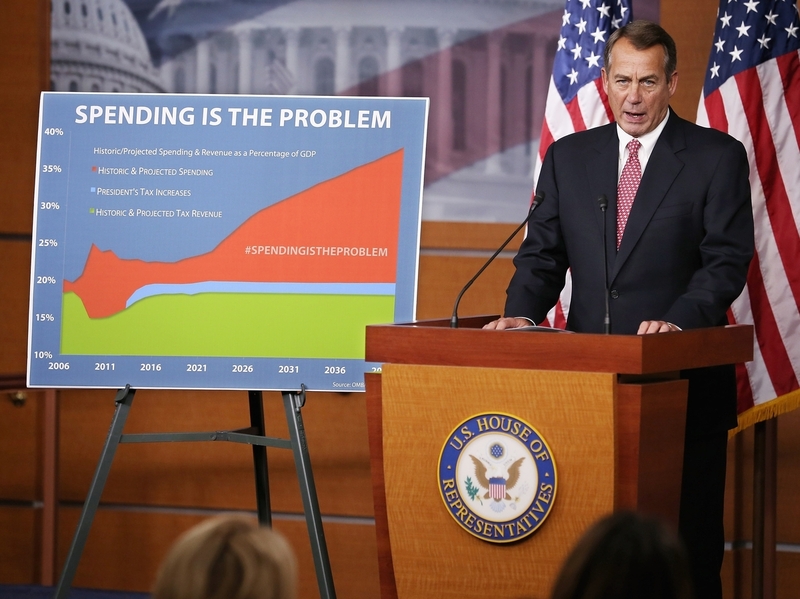 Speaker of the House John Boehner holds his weekly news briefing in the Capitol Visitors Center on Dec. 13, 2012 in Washington, D.C. In covering the precarious so-called "fiscal cliff" negotiations, NPR reports have been filled with conversations dissecting which Americans might see their taxes return to higher levels. 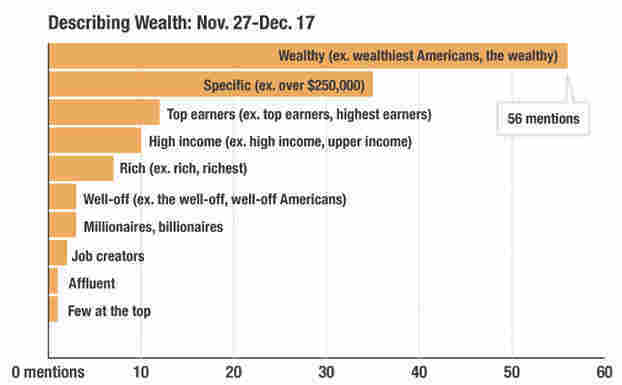 These discussions often mention "the wealthy," "the rich," "the top earners" — those Americans who make lots of money, or at least much more than the rest of us. 1. It is vague. There is no official definition of 'wealthy.' Why not just say $250,000 per household? 2. It confuses income with wealth, i.e., flows with stocks. If you have $250,000 in household income, $1 million in assets, and $1.5 million in liabilities, you are not wealthy. You are insolvent — possibly a candidate for a personal bankruptcy filing. 3. If writers do not care to cite actual taxable-income numbers, they might at least refer to 'high-income taxpayers' rather than 'the wealthy'. While still light on data content, at least that alternative would avoid conflating income and wealth. Irwin could have complained about other common terms for this fortunate group that are equally less than satisfactory. They include "top earners" "affluent," or just "rich." Then there is the reverse phrase of "job creators" pushed by the ideological right in a battle to re-frame the debate. One of the problems with this type of wording is that the terms are relative and situational. A "wealthy" family in a rural town would not be considered among the "top earners" in New York City. Furthermore, terms such as "wealthy," "rich," and "affluent" describe people with a certain lifestyle or culture — not citizens within a specific tax bracket. To explore this issue, I compiled a tally of how NPR reporters and hosts on All Things Considered, Morning Edition, Weekends on All Things Considered, and Weekend Edition referred to those "few at the top." I excluded references made by guests or in quotes in order to capture the references choices made only by NPR voices. In the three weeks evaluated (Nov. 27 to Dec. 17, 2012), the most popular category of descriptors was "wealthy," proving Irwin's frustration to be warranted. To NPR's credit, however, specific references came in a solid second place. The other categories of references were much less common, including variations on "top earners" as well as the "higher income" that Irwin suggests. Politicians have their own favorite terms, and this can lend a slant to some of the above word choices. In these cases, the word choice is political; each side selects the phrase that best supplements their argument. For example, President Obama is fond of using variations on "the wealthiest Americans" when speaking to the public on the fiscal cliff negotiations. In his first post-election press conference, he used "wealthiest" or "the wealthy" almost exclusively (with a "folks at the top" thrown in). In contrast, Rep. John Boehner is more likely to refer to "job creators" or "small businesses" when he makes his case to the public, though this change in the subject is no more accurate. As consumers, we are all "job creators." The link between a minor increase in the income taxes of a few upper income people and investments to create or expand businesses is unproven. Obama, meanwhile, uses "small businesses" to support his side of the case, too. It could be that reporters vary their terms to avoid sounding repetitive on air. After all, who would want to say some variation on "couples having combined incomes of $250,000 or higher per year" more than a few times in one report? But since many of the alternative terms can be politically charged in this ongoing debate, I would argue that it is worth adding the extra words for the sake of clarity at some point in their stories. Laura Schwartz is an intern in the Ombudsman's Office whose internship ends with the year. On her own initiative, she has done many of the quantitative studies and charts of recent months. This post was edited by Edward Schumacher-Matos.